Like most children, my first friends were sort of chosen for me—little blonde girls at church whose parents were friends with my parents. But I remember my very first friend who I chose for myself in grade two. Jasmeet joined my class a couple months after school started. I swear she had a smile you could see a mile away and her jet black hair swished across her back in a braid thicker than my arm. Two weeks after she joined our class the teacher let her make a new nametag for her desk. She wrote in all capital letters: JASMINE. “It is,” she said timidly. I remember being shocked. And also trying to figure out why towel and head were really bad words when you put them together. I had also seen her dad pick her up. He wore mostly white and had a white turban on his head. He was different than the other dads. But guys, the movie Aladdin had just come out, so I was pretty sure my new friend Jasmeet was a real life princess. I was completely in love with her. Her parents must have seen Aladdin too, because the day after parent-teacher conferences my new friend was calling herself JASMINE. Looking back, I think my teacher ran an impressive PR campaign on behalf of the newly branded Jasmine. Most of the class embraced the sweet Indian girl with the Disney princess name. It was like they completely forgot she was the same girl they teased at recess only weeks before. I still called her Jasmeet most of the time and I still thought she was a princess. That year, I got in trouble for the first time ever. I was talking too much. My teacher had to park the little girl with the long braid on the opposite side of the room from the little girl with the stringy bangs. We both got our work done fast and sometimes we were allowed to go to the library together to find books to fill our time. Jasmeet helped me with my geography. I helped her with her math. We swapped stories about our family traditions. We thought we were more the same than different. Neither of us had ever celebrated Christmas or Easter and we didn’t know what bacon was. It has been 23 years and I still wonder how she fared at the school she moved to the following summer. I still wonder if the punks in the back of the room threw insults at her family. I’m pretty sure I still love her. Seven-year-old Sarah thought the world belonged to everyone. I was young enough that I didn’t need to pretend my friend wasn’t different from me. I could just announce that we were. I could ask her why we were different and then listen when she answered. 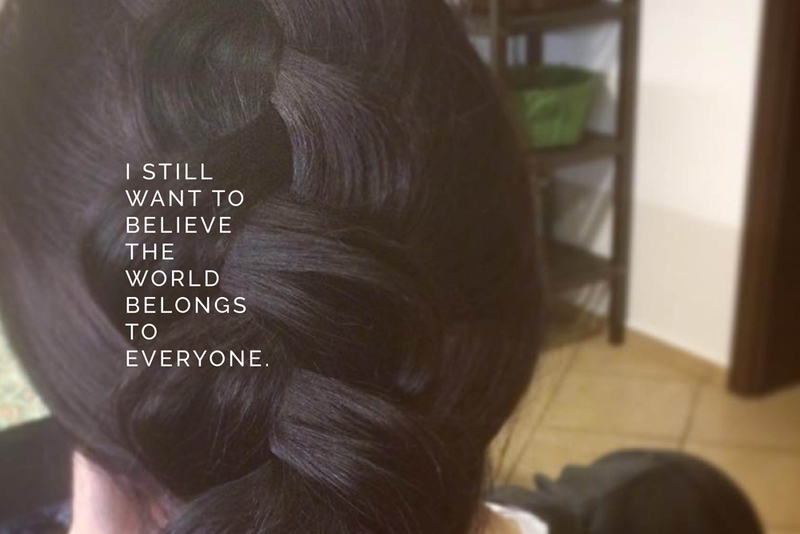 I still want to believe the world belongs to everyone. I still want to ask about the ways we are different and I still want to listen when people answer. In 1993 my new friend was abused because she was a brown girl in a white world. It is 2016. It is time we stop that.